All over the world, the disposal of the used Sanitary Napkins has been a very common problem. Especially in India the used napkins are thrown to bathroom dustbins as it leads to embarrassing visuals and smells and the used napkins are Flushed into the Drain. Both the above methods of disposing Sanitary Napkins create problems. The Flushing in Drain results Clogging in Drain. The Drainage Line Chock-ups or Plumbing Line Blocking Problems occurs and throwing in Dustbins results Health related Problems due to hazardous contents in the used Sanitary napkins. Keeping in mind we are keen to manufacture the machinery that is used to protect the environment. Our Sanitary Napkin Incinerators are used to resolve this problem. Our napkin destroyers are very useful to destroy napkin waste in a very scientific and hygienic way. It is the best solution for sanitary napkin disposing needs here the used napkins is converted into a sterile ash. It helps to destroy used napkins in a scientific and hygienic way so, it is very suitable for all ladies toilets to get a pollution free hygienic environment. 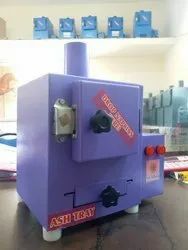 Being one of the reputed organizations in the market, we are engaged in offering an exclusive range of Sanitary Napkin Incinerator. 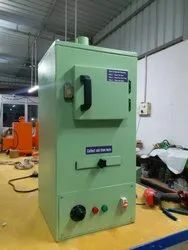 The provided napkin incinerators are incorporated with a Temperature Controller which works on ON/OFF system to keep the temperature constant through out the process. 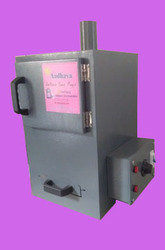 Offered napkin incinerators are used for undertaking the burning of sanitary napkins in a cost-efficient manner. 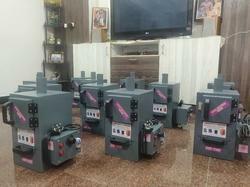 Moreover, these napkin incinerators are provided in diverse specifications as per the demand of customers. Instant disposal of used Napkins in a very scientific and hygienic way. Top Sliding Door for easy operation. Easy and convenient to install inside the toilet and Wall Mountable. For ABM (Aadhava Burn Magic) model the outside is built with Mild Steel with Powder Coaing. 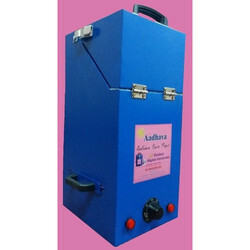 ABM (Aadhava Burn Magic) model having Stainless Steel body for maximum lifetime. The ash is collected in an Ash Collection tray at the bottom of the Incinerator. Just Start and Forget. It Burns and Stops Automatically. Specially designed for girls to operate very easily and safely. Complete burning of napkins only less than 5% ash per Napkin is generated. Complete burning of napkins only less than 5% ashes per Napkin is generated three stage computer programmed Control of Sensor, Thermostat and timer gives long life for Heater and reduce the electricity bill. With the valuable assistance of skilled team of professionals, we are engaged in offering an extensive range of high-quality Small Napkin Destroyer. 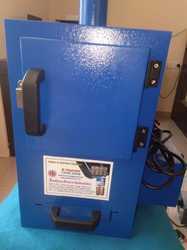 With the valuable assistance of skilled team of professionals, we are engaged in offering an extensive range of high-quality Sanitary Napkin Burning Machine. Double wall Ceramic Board technology 'PUF' insulation. "Epoxy Powder coated" with 7 time process. Epoxy Powder coated" with 7 time process. With the valuable assistance of skilled team of professionals, we are engaged in offering an extensive range of high-quality Stay-Free Napkin Destroyer Machine. With the valuable assistance of skilled team of professionals, we are engaged in offering an extensive range of high-quality Industrial Napkin Destroyer Machine. With the valuable assistance of skilled team of professionals, we are engaged in offering an extensive range of high-quality Eco- Friendly Sanitary Napkin Destroyer. 1. Double wall Ceramic Board technology ‘PUF’ insulation. 2. “Epoxy Powder coated” with 7 time process. 3. Heater of high power makes the temperature rise quickly and improves the efficiency. The problem of improper disposal of menstrual waste is measure road block to our achieving “Swachh Bharat” mission’s goal to create a clean India. This waste is problematic for several reasons. Heaps of sanitary napkins with a large amount of disease causing bacteria on them pose a significant threat to the hygiene in the surrounding area. Young girls and even certain older women’s are not aware of the hygiene problems cause by improper disposal of Napkins. 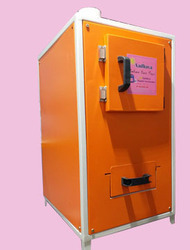 This system is one of the best way to dispose menstrual waste is to burner is napkin using electrical fire based burner without allowing smoke generate in the process to escape into the atmosphere. This steps must be taken to solve the problems that improper disposal of napkins causes to the Environment and to the public health. Human activities create waste, and it is the way these wastes are handled, stored, collected and disposed of, which can pose risks to the environment and to public health. The Management of solid waste is an important concern in developing and emergency conditions, e.g. those of a refugee camp, where solid waste management infrastructure and services are far from achieving basic standards in terms of hygiene, efficient collection and disposal (Collivignarelli, 2004). These situations are characterized by: difficulties in evaluating and choosing the most appropriate solution with respect to the specific operating conditions, inadequate service coverage, operational inefficiencies of services, limited utilization of recycling activities, inadequate management of non-industrial hazardous waste, and inadequate landfill disposal. Moreover, developing and emergency conditions are characterized by difficulties in evaluating and choosing the most appropriate solution with respect to the specific operating conditions. This paper analyzes several problems related with solid waste disposal and it describes an appropriate solution for Saharawi refugee’s camps, South Algeria. Sanitary napkins typically used by women .Particularly an issue where solid waste collection and disposal systems do not operate effectively. Long-lasting, comfortable, stain-free and affordable are the thoughts that come to every women’s mind when she picks up a disposable sanitary napkin. Every month, 353 million women and adolescent girls across India need to dispose of their that women did not want the menstrual waste in their houses so they disposed it away without thinking much about how it will be disposed of further. In fact it was found that even if the facility was provided the behavior did not change much because of human psychology patterns. 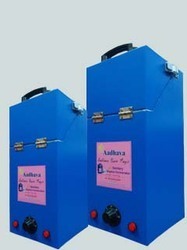 Sanitary napkin incinerators are used to resolve this problems. Incinerators need to be used at a certain temperature level. 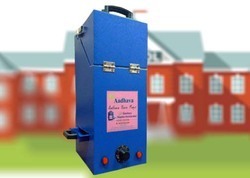 Schools, institutions and even at community level these incinerators can be installed. Incinerators can be used in controlled environment so that the gases released do not harm a larger area. However this can only be a better alternative. The Government of India has laid down specific laws for waste management and handling, keeping in mind environmental protection and prevention from health hazards. Following is an exhaustive list of acts that govern the disposal system of India according to the ministry of Urban development. 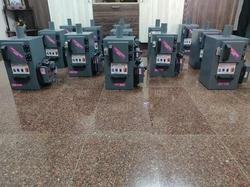 We "Sri Adhava Power Industries" is a producer and Supplier of Sanitary Napkin Destroyers and Vending Machines. Everywhere throughout the world, the disposal of the utilized Sanitary Napkins has been an extremely normal issue. Particularly in India the utilized napkins are tossed to lavatory dustbins as it prompts humiliating visuals and smells and the utilized napkins are flushed into the Drain. Both the above strategies for disposing Sanitary Napkins make issues. The Flushing in Drain comes about Clogging in Drain. The Drainage Line Chock-ups or Plumbing Line Blocking Problems happens and tossing in Dustbins comes about Health related Problems because of perilous substance in the utilized Sanitary napkins. Remembering we are quick to produce the apparatus that is utilized to ensure the earth. Our Sanitary Napkin Destroyers are utilized to determine this issue. Our napkin destroyers are extremely valuable to decimate napkin squander in an exceptionally logical and clean way. it is extremely reasonable for all women toilets to get a contamination free clean condition. Electrically Operated And Auto Power Off For Reducing Power UtilizationSimple InstallationExceptionally Compact In SizeProgrammed and Sensor Models Increase The Heater And Machine's Life What's more, Reducing Electricity ChargesHigh Density Heat Proof Ceramic Boards And Puff Insulation For Brilliant Thermal ProtectionRemovable Ash Tray For Easy To Clean The AshesFinish Burning Of Napkins With Less Than 1Gram Ash Per NapkinElectronic LCD Display For Real Time Status3&4 Safety Cut OffsFloor Type And Wall Mounting Types Available. 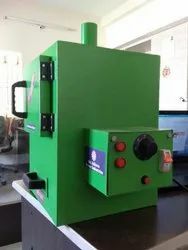 We have earned a reputed name in providing the finest quality assortment of Sanitary Pad / Napkin Burning Machine. Our machine is fabricated by our seasoned professionals from premium quality raw material with the help of modern technology. Our quality controllers check this machine on numerous parameters before it is sent for shipment. 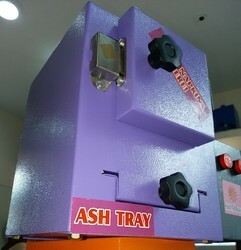 The offered machine is provided in different specifications as per the needs of the customers. With the valuable assistance of skilled team of professionals, we are engaged in offering an extensive range of high-quality Mini Napkin Destroyer. With the valuable assistance of skilled team of professionals, we are engaged in offering an extensive range of high-quality Sanitary Napkin Destroyer.